The savory fifth taste known as umami is frequently associated with meat. In fact, the taste itself is often described as “meaty” or sometimes, “brothy.” However, umami does exist in plant-based foods as well. Vegetarian diets can contain plenty of umami. Even those who follow a vegan diet sink their teeth into meals made all the more delicious because of the satisfying, savory taste of umami. What is it that gives veggies their umami taste? The amino acid called glutamate, or glutamic acid, is what conveys the umami taste. Any foods high in this amino acid will provide umami. Amino acids are the “building blocks” of proteins, so in general people tend to associate glutamic acid with protein foods—and most people think of meats when they think of protein. Of course, fish, shellfish, milk and cheese are also high in protein, as are legumes. And indeed, these foods contain glutamate and thus provide umami. There are certainly vegetarian and vegan sources of glutamate. There are umami-rich foods to fit every type of vegetarian diet. 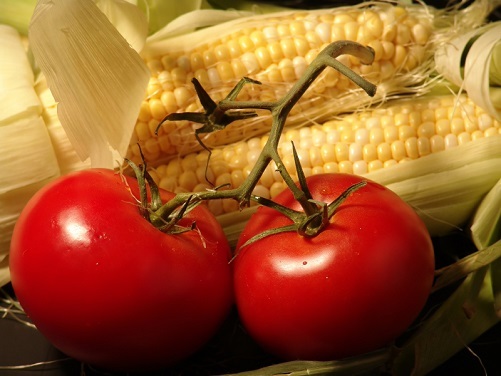 For example, potatoes, tomatoes, corn, mushrooms and peas are some of the vegetable sources containing glutamate. If one consumes dairy products, the world of cheese opens up new possibilities for including umami ingredients in cooking. Also, condiments and ingredients like monosodium glutamate, soy sauce, liquid aminos, tamari, miso, marmite, dashi, nutritional yeast and fish sauce are all potent umami ingredients. Check out this graphic for a look at the wide variety of umami-containing foods and staple ingredients used by cooks around the world to create prized cultural dishes – many of them vegetarian. Tomatoes, well-known as being high in glutamate, are the basis of many umami-rich vegan dishes. The glutamate content of tomatoes increases with ripening, so using ripe, red tomatoes will contribute more umami taste to a finished dish than using unripe, green tomatoes. (Interestingly, it pays to keep the tomato seeds in the dish if you want the most umami taste in your finished dish.) The ripening concept also applies to cheeses. Cheese ripening, or aging, is a process that changes cheese’s texture and taste, but also changes its chemical composition, resulting in an accumulation of free amino acids. There are lots of glutamate-rich cheeses to choose from, including Parmesan, Emmental and Roquefort. We’ve collected a few umami-rich recipes that are vegetarian or vegan so you can get to cooking right away! Think of Umami as opening up a whole new vegetarian world!